April 17, 2012 - Air Force Space Command officials announced that Airmen assigned to the command will cease wearing flight suits, the green flight jacket and the A-2 Leather Jacket by the end of the fiscal year. This policy only affects Airmen assigned to AFSPC. Directed by Gen. William L. Shelton, the AFSPC commander, the move is designed to standardize uniform wear across Space Command in a resource-constrained environment. AFSPC officials stopped purchasing Flight Duty Uniforms, Desert Flight Duty Uniforms, A-2 Leather Jackets and associated patches for space operators March 14. "We want to create synergy among all personnel across the command," Shelton said. "When personnel wear the same uniform, it has a unifying effect toward mission accomplishment. Standardization among the entire command prevents the perception of a 'haves' and 'have nots' situation; the very meaning of the word 'uniform' should drive us toward standardization." This policy change was presented to AFSPC leadership from personnel within the command during an effort to identify command-wide efficiency opportunities. The policy affects approximately 1,800 Airmen in the Space Systems Operations and Space and Missile Operations career fields. It will save an estimated $670,000 per year during a time of fiscal constraint throughout the Air Force. An AFSPC policy letter issued April 10 states that starting Oct. 1, military personnel in any Air Force Specialty Code assigned to an AFSPC unit will no longer be authorized to wear the flight suit and green flight jacket, unless they are engaged in flying operations, nor are they authorized to wear the A-2 Leather Jacket. "Between the expense of purchasing these items and the fact that our operations don't involve flying, this recommendation was good common sense," Shelton said. Air Force Space Command (AFSPC) is a major command of the United States Air Force, with its headquarters at Peterson Air Force Base, Colorado. AFSPC supports U.S. military operations worldwide through the use of many different types of satellite, launch and cyber operations. 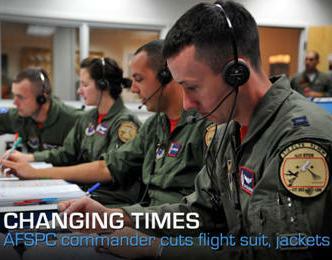 Operationally, AFSPC is under the Combatant Commander of the U.S. Strategic Command. Approximately 47,000 people, including 25,400 active-duty service members and civilian employees, and 14,000 contractor employees, perform AFSPC missions at 88 locations worldwide. Its 25,400 employees are divided into approximately 7,100 military personnel and 18,300 civilian employees, although their missions overlap.